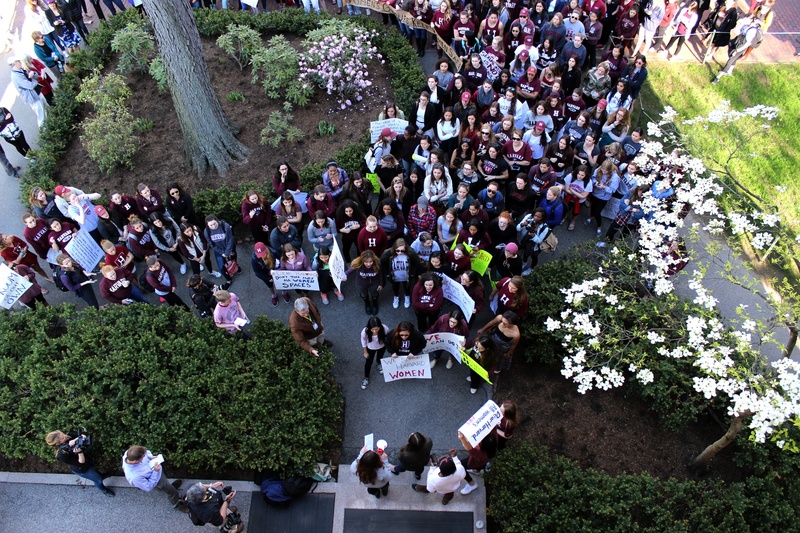 Days after the sanctions' debut in 2016, scores of sorority and female final club members protested outside the president's office. Two years and three months later, every one of Harvard's all-female groups has agreed to go co-ed. Editor's Note: This article has been updated with statements from the IC Club and the Exister Society. 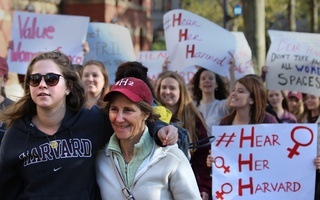 Harvard’s historically all-female social groups appear to be no more. The Pleiades Society, the IC Club, and La Vie Club — the last three women-only final clubs left standing — have agreed to eventually admit people of all genders and have applied for recognition from Harvard’s Dean of Students Office, according to an email obtained by The Crimson. College recognition, which demands gender-neutral membership practices, ensures exemption from Harvard’s social group sanctions. The sanctions, which took effect with the Class of 2021, bar members of single-gender final clubs and Greek organizations from holding campus leadership positions, varsity team athletic captaincies, and from receiving the College’s endorsement for prestigious fellowships. “We have made a firm commitment to never require a member to choose between achieving their individual aspirations and being part of the IC community,” members of the club wrote in a post on their website. 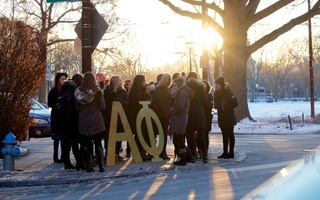 Ten women’s groups — four sororities and six female final clubs — have now taken steps to comply with the College’s controversial social group policy. Of Harvard’s 13 all-male groups, at least four have done so. Former University President Drew G. Faust's debut of the penalties in May 2016 at first drew strident protests from many female social groups. Some club leaders vowed publicly that their organizations would never change. A little more than two years and three months after Faust’s announcement, no established women’s groups are left to welcome the Class of 2022 to campus. The IC declared it plans to go co-ed earlier this month. Its announcement may also mark the beginning of the end for the longstanding all-male membership policies of the Owl Club. Members of the IC wrote on their website that they plan to use the next year to “explore paths of increased inclusion” in the coming year. One such path, the club said, could involve partnering with the all-male Owl Club. To further that goal, the two groups have embarked on an experimental alliance. The Owl and the IC will spend the upcoming school year plotting and executing undefined “opportunities for increased cooperation,” according to the statement. After publication of this article, the IC updated its website to specify that it will enact no "major changes" to its recruitment or day-to-day operations during the 2018-2019 academic year. Alterations to its membership policies will instead take effect in the 2019-2020 academic year, according to the updated post. The Owl did not respond to requests for comment. 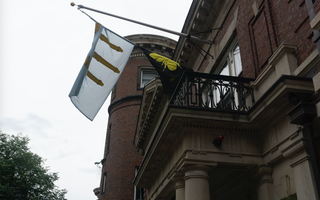 The flags of the Bee and the Delphic Clubs fly outside the clubhouse on Linden St. historically owned by the Delphic. The two clubs have shared their membership and clubhouse since Sept. 2017. Their partnership somewhat resembles a similarly vague bond forged about a year ago between the historically all-female Bee Club and the historically all-male Delphic Club. Those two clubs in August 2017 agreed to share membership and a clubhouse, marking the first union of male and female clubs since administrators revealed the sanctions. The Pleiades Society and La Vie Club have not publicly acknowledged they agreed to go gender-neutral and applied for College recognition. Leaders of both groups did not respond on the record to requests for comment. The IC plans to seek “Interim Recognition,” according to its website. That level of recognition is the lowest of the three tiers that social groups can earn under a system Harvard debuted late last semester. Groups receiving interim recognition do not have to go co-ed right away, but must demonstrate a commitment to adopting gender-neutral membership practices in future. Their only reward is freedom from the social group penalties, though groups in higher tiers can expect financial support. In total, 14 of Harvard’s social groups have now applied for recognition, according to Associate Dean of Student Engagement Alexander R. Miller. He declined to name the groups. While at least four historically all-male groups have knuckled under and promised to go co-ed, the vast majority of the others remain defiant. “We are not seeking recognition at any time under any terms,” he added. Other all-male groups did not respond to requests for comment. 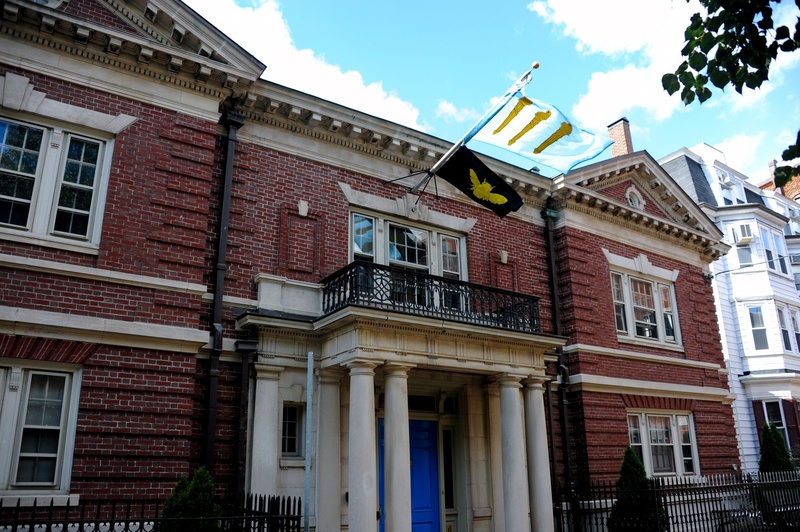 Rather than submit to administrators’ will, three of the most storied all-male final clubs — the A.D. Club, the Porcellian Club, and the Fly — recently joined with three campus fraternities to battle the sanctions at the federal level. The groups, who call themselves “the Cambridge Coalition,” are lobbying Congress to pass legislation that could force Harvard to choose between the sanctions and millions of dollars of federal research funding. Porteus said he believes the female groups’ decision to obey the sanctions stems from their relative youth, which translates to fewer resources and smaller alumni networks. Most men’s clubs are at least one century old; women’s groups, by contrast, began arriving in Cambridge in the late 1990s or early 2000s. The Fly Club is one of several all-male final clubs at Harvard. Regardless of motive, the large number of single-gender groups that have now gone co-ed signals a victory for proponents of the policy, including their most visible champion Dean of the College Rakesh Khurana. 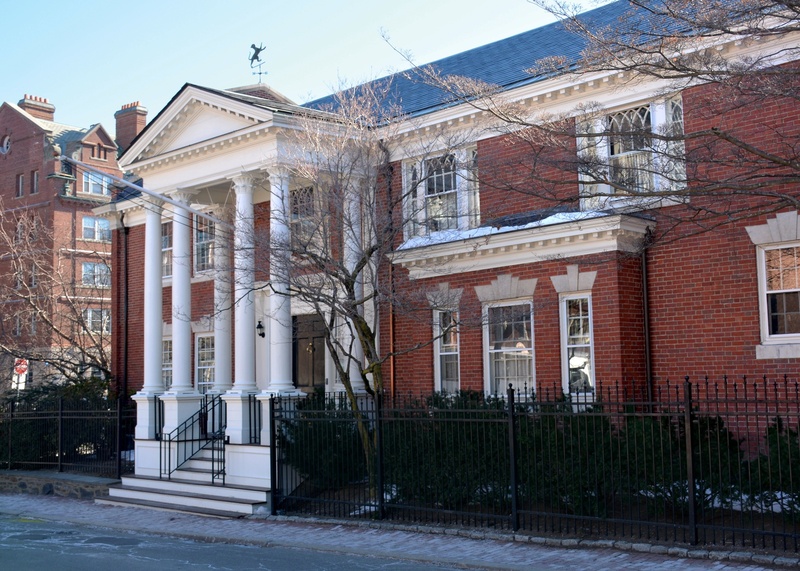 Khurana — backed by Faust and the Harvard Corporation — has remained steadfastly committed to the sanctions despite facing significant opposition from some students, alumni, and donors. Still, Khurana and other administrators confront a new hurdle as the fall 2018 semester begins: enforcement. It remains unclear how Harvard officials plan to determine whether students have disobeyed the policy. Administrators have insisted in interviews with The Crimson that they will not actively seek out violators. They have also promised they will not solicit or act on anonymous complaints. An anonymous system is “not what we are, in our community,” Dean of Students Katherine G. O’Dair said in a March 2018 interview. No one — not O’Dair, nor Assistant Dean of Student Life Alexander R. Miller, nor Khurana — has answered questions asking what Harvard plans to do instead. The disappearance of all-female social groups at Harvard prompted outrage from some Greek life advocates. 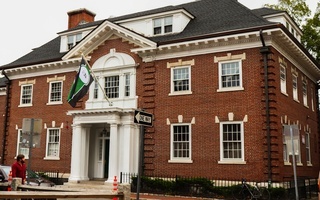 Carole Jones, chairman of the National Panhellenic Conference, an umbrella organization for Greek organizations, sharply criticized the dissolution of Harvard’s sororities. Gentry McCreary, a consultant at the NCherm Group, which provides legal and consulting assistance to college and universities on Greek life issues, warned of another potential consequence. He said the sanctions may force some single-gender groups to go underground and operate in secret, leading to reduced oversight of the groups and increased risks for students. “The unintended consequences of these types of actions could be severe and create a much more dangerous environment for students,” he said. The social group penalties appear to have led to the formation of at least one new, low-profile social group. Several students founded a new final club called the Exister Society — nicknamed the “X” — in fall 2017. At the time of its founding, it was all-female, the group's president Eliza Alston '19 previously told The Crimson. The X has so far demonstrated a desire to fly under the radar compatible with its name; it appears to barely exist. For months, the club remained the stuff of dining hall rumors. Its establishment was never publicly announced and it has not sought to openly recruit students. In response to a question asking whether the group had gone co-ed or applied for College recognition, Alston wrote in an email that the X was not formed as a single-gender group, but as a "women's empowerment group." "We do not discriminate based on gender when accepting members," Alston wrote. "The X consists of confident, hard-working, empowered students, and we will not force our future members to choose between holding a leadership role on campus and being a member of our society." Alston said X members "welcome the opportunity" to work with administrators in the coming months to ensure that the X complies fully with the sanctions. 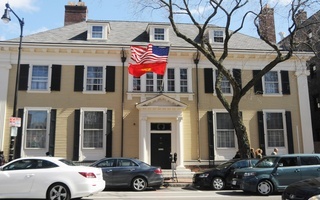 Miller wrote in an emailed statement that administrators, too, “look forward” to collaborating with social organizations across the College to promote “an inclusive social life” in Cambridge. — Staff writer Michael E. Xie contributed reporting. — Staff writer Shera S. Avi-Yonah can be reached at shera.avi-yonah@thecrimson.com. Follow her on Twitter at @saviyonah. — Staff writer Caroline S. Engelmayer can be reached at caroline.engelmayer@thecrimson.com. Follow her on Twitter @cengelmayer13.